Why wear red on Thursday? Be a part of the solution, not the problem! The meeting starts at 6:30pm sharp! Attendance is now available via Tele conference, please access your Union Email for details. August 3, 2019 at 11:59pm The BST 2015 Agreement ends ! We have(5) months left to get ourselves' ready. It is imperative you make your Membership Meetings to find out what is going on!!!! D3 Bargaining Team is ready, are you!!! Don't Let Washington take your work from you!!!!!! The CWA Joe Beirne Foundation will award 16 partial college scholarships of $4,000 each for two years for the 2019-2020 academic year. CWA members, their spouses, children, and grandchildren are eligible for the scholarships, including the dependents of retired, laid-off, or deceased members. Applications are available only online at the Foundation's website. The final deadline for the 2019-2020 school year is 11:59 p.m., EDT, April 30, 2019. The Beirne scholarship program is made possible by funding from CWA locals. Read more about the program here. You may need this information more than you think, now more than ever! 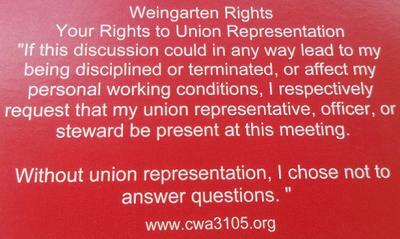 Text 00411 to 84483 to receive ALL messages from CWA Local 3105. Text HELP for help. Text STOP to cancel alerts at any time.For customer support contact info@rainedout.com or 800-230-1933. Msg&data rates may apply. Notify the Union of Company infractions against the Union Contract and members. If you are not a member of Local 3105, to report infractions, please contact the local you are a member of. Please click on the link, Report Infractions filling out all the information requested, giving as much detail as you like. The membership needs to keep the Union informed as to all happenings, we can't take action if we don't know what is going on, please don't assume that we know of every thing that is going on!!!! Contact Webmaster Josh with any questions or comments!